Sometimes pets are part of a relationship from the start, now that there are dating services for animal lovers like Leashes and Lovers. 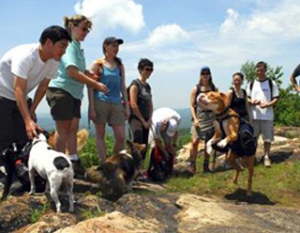 This organization unites dog lovers for both friendships, and potential relationships through outdoor activities. Meeting the parents can be a test for any new relationship. But what about meeting the pooch? Pets are part of the family these days, which means they may have opinions about who you’re dating. “In the old days, you had to meet the mother. Now you have to meet the dog and get the dog’s approval,” says Stephanie LaFarge, director of counseling services for the ASPCA and an expert on the human-animal bond. Sometimes pets are involved in a relationship from the start, now that there are dating services for animal lovers and couples who meet at the dog park. But if they’re not, when the introduction happens, it’s important to take the time to make it a positive experience. What’s at stake is not just a potential significant other’s relationship with the animal, but your own feelings as well. It’s hard to ignore a pet’s response: “My cat just loves him” can be a huge positive, but if your animal reacts fearfully, it can raise new doubts. If you’re the one meeting a pet for the first time, make an effort in advance. You may think you know dogs or cats, but a simple thing like where a dog likes to be petted can make a big difference. And showing concern for and interest in the pet is a way of showing concern for the person, says LaFarge. “A lot of people are more emotionally touched when you do something for their pet, more than if someone brings flowers on the first date,” she says. If you’re the pet owner, have your animal under control — no one likes being jumped all over at a first meeting — and offer your date information. If the cat doesn’t like to be picked up, don’t leave someone to find that out by experience. As a relationship develops, certain pet issues are typical, such as those over hygiene and physical intimacy. If your date spends all his time trying to get cat hair off his clothes, or you think it’s gross that she kisses her dog, don’t assume that the problem is going to magically disappear with time. It’s important to remember that conflicts over the pets are often a sign of more fundamental differences. For example, money management is a common relationship issue that often surfaces over the question of how much is appropriate to spend on the animals. Sometimes, you can turn different priorities into an advantage. Gold says he sees many relationships where the man is more concerned with keeping the pet active and fit, and the woman is focused on diet and vet care, which can work as a division of labor rather than a source of conflict. But for stubborn problems, remembering that many pet conflicts aren’t really about the animals can often be the route to a solution, as it was for one couple having the very common argument about whether the pets should be allowed in the bed. Gold says that the woman insisted the cats always be in the bedroom with them, and the husband said it made him anxious. “Each thought the other was stubborn and spiteful,” says Gold, until he asked a question of the wife: Are you an only child? Yes, she said, surprised — and she’d always wanted sisters. Her husband, as Gold expected, had come from a large family of eight siblings where he felt that he never had any privacy. “When they got to see that, they were able to come to a compromise,” says Gold. “They really had to make that connection first.